Here at First Round Capital, we see a lot of business plans for consumer-facing internet services. Most assume a significant portion of their revenue comes through advertising -- but almost all of them have a "premium/subscription" option. Typically that subscription revenue accounts for 20-40% of total revenue, and is based on a very low ($1-5/month) subscription fee. When asked to support these subscription revenues, entrepreneurs almost always say "well, it's very cheap ($2 a month) and we're only assuming 5% of our users take advantage of it)." On the surface, a reasonable position. However, that is rarely how things play out. 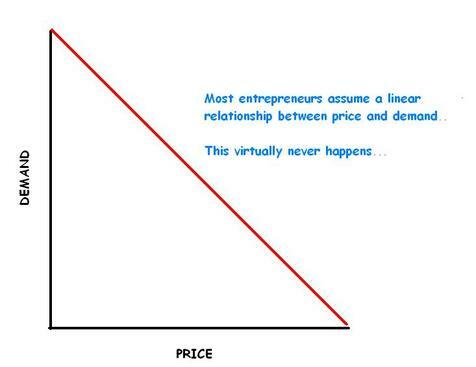 Most entrepreneurs fall into the trap of assuming that there is a consistent elasticity in price - that is, the lower the price of what you're selling, the higher the demand will be. So you end up with hockey stick looking revenue charts that go up and to the right, all supported by an "it only costs $2 month" business plan. The truth is, scaling from $5 to $50 million is not the toughest part of a new venture - it's getting your users to pay you anything at all. 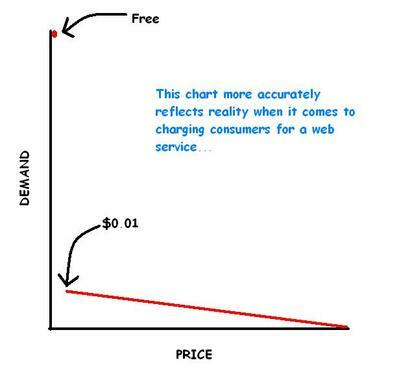 The biggest gap in any venture is that between a service that is free and one that costs a penny. I can't think of a single premium service that has achieved truly viral distribution. Can you? Consider the pay-per-download music sites of the late '90s. None came even close to matching the widespread popularity of Napster or Kazaa. By 2000, Napster was estimated to have 40 million registered users, with as much as 80% of external network traffic on colleges consisting of MP3 file transfers. Kazaa has had almost 400 million downloads of its client to date. Assuming 2 downloads per user that means around 20% of all Internet users have downloaded Kazaa. And the same phenomoenom is occuring now with movies via Bit Torrent -- as opposed to CinemaNow or MovieLink. That's the power of free. At some point, the cost to acquire a paying customer is so high, it makes sense to consider shifting from a pay model to a free model. In these cases, asking “who would pay to reach these consumers” (or "who can subsidize these users) creates an opportunity to build a more valuable business through the combination of exponential growth and targeted advertising. This is what we're seeing today with Jingle Networks, owners of 1-800-FREE411. By harnessing the power of free 411 calls, Jingle has already managed to capture around 5% of the overall 411 market. And it's interesting to note that "cheaper" directory assistence services such as Easy411 and 4114Cheap existed for years before Jingle was conceived and have gone nowhere. It happened in music. It happened in movies. And it's happening in directory assitance. Now I’m looking for other industries that are going to be converted. If you've got a plan that uses the free model to get that first penny and disrupt an industry, I'd love to hear about it. It’s a great way to shrink a market. To be fair to these VCs, they’re not advocating doing everything without pay. They’re suggesting free as a tactic towards getting paid in other ways: through advertising, or by premium services (as in a freemium model), or maybe even through being acquired by a company with a large wallet. Free is only a tactic, though, not a business model. Conflating the two misleads web application developers into thinking they don’t need to do the hard work of figuring out what’s really of value to users before they build and launch their online service.